One of the things that I love about the Pacific NW is how pretty and green the outdoors stays throughout the year. It is so appealing with the forest and overgrown plants and mosses. 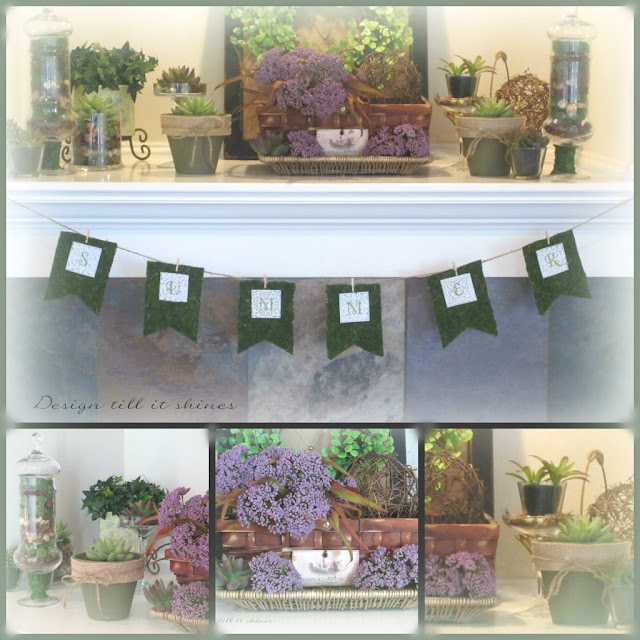 I wanted to create a little bit of that in our home and add a mossy banner to our mantel. 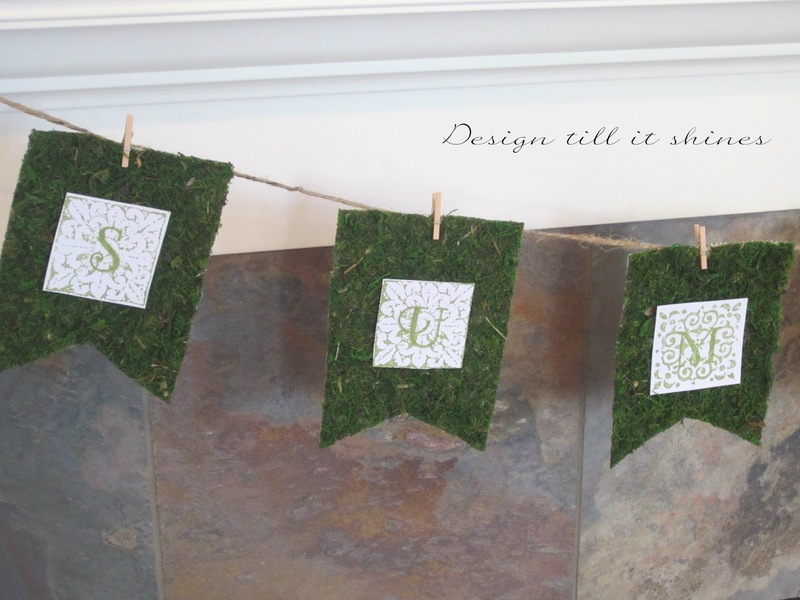 I've been inspired by some of the blogs that feature these banners made of moss and all the mossy letters. And with the official start of summer beginning in a few weeks, I thought I should get my mantel decorated and create my summer banner. 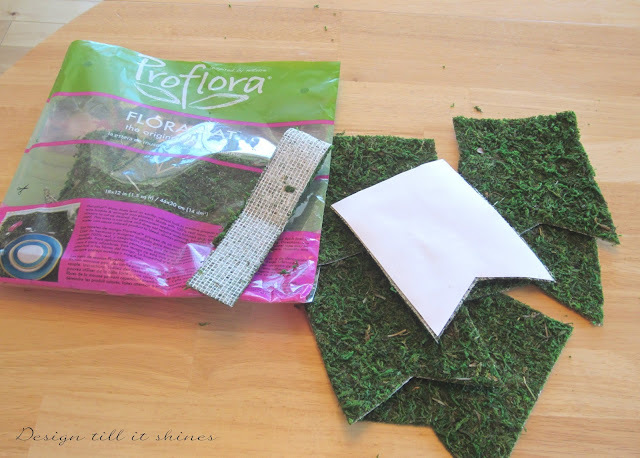 I started out with a moss mat that you can buy in any craft store and started cutting out my shapes. It is 100% moss that is attached to a backing that makes it easier to cut. I bought one package and it was more than enough to make my banner with a little bit left over for a smaller one as well. 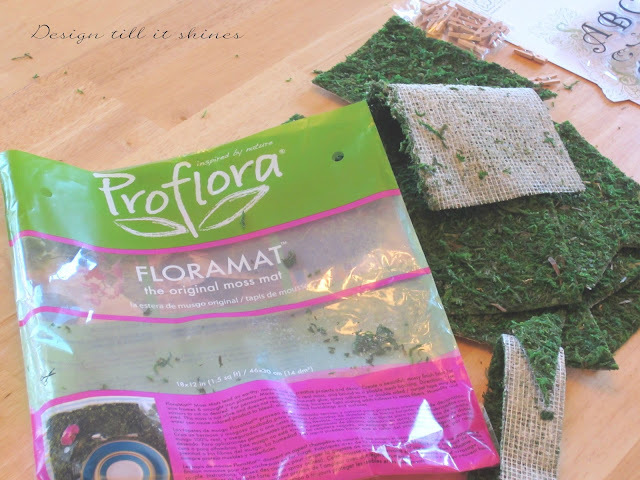 Any moss product is extremely messy because so much of the moss comes loose, especially as you are cutting it. I used card stock for the backing and created a template for the moss shapes. Since I wanted them be a little larger than my backing, I mod podged the card stock on after I cut out my template, but I would advise if you use this method you might want to trace the template design onto your craft paper first without cutting it, then mod podge it (or use spray adhesive) to the sheet of moss and cut out your shapes. You might get some glue on your scissors, but I think it might be less messy and faster this way. At the time I didn't know how I was going to attach my banner to my cord, so I did it the more time consuming way. It's always nice to have precut shapes and all you have to do is assemble things, but I never do my projects that way unless I'm really rushed for time. I enjoy being thrifty too much, especially on craft projects. 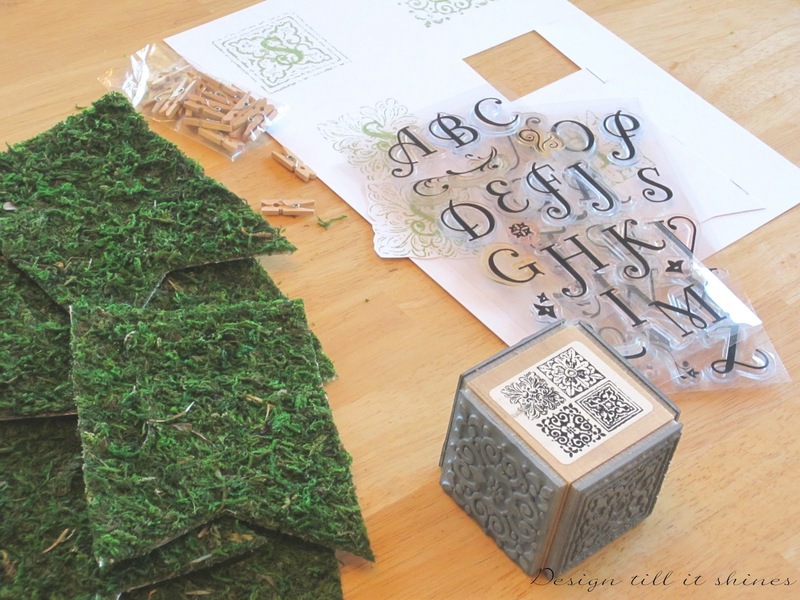 I wanted to continue the green theme on my banner so I came up with a stamp design using my background cube and letter stamps. I already had the stamps and some mini clothespins to attach the pieces to my banner on a string of jute. I always try to do things the easiest and quickest way possible as long as I can still get the results I want. 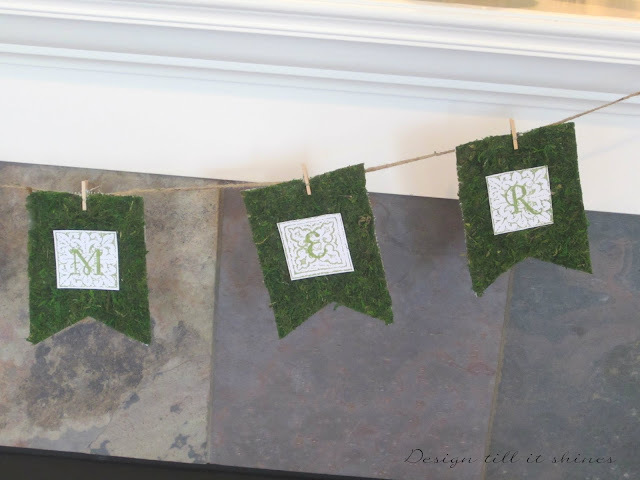 Since I've been a stamper for quite a few years I already had most of my supplies for this, but there are so many creative things that you can do to your banners to personalize them to fit any occasion without buying a banner kit. 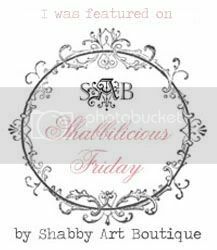 I like my projects to be simple and since I don't follow trends my creations are always in style, at least to me! I wanted to continue the earthy, mossy theme on my mantel so I added some moss, rocks and filler to my tall jars and some artificial succulents to some small containers. I don't have a green thumb, as far as houseplants are concerned so I just used things I had around the house to fill in the mantel. I only decorate our mantel a few times each year, since It is a large recessed area and hard to decorate. You have to fill in the depth of the opening and I didn't have any large plants to fill it in, so I managed with what I had. Since the front of our fireplace is slate I thought it fit in with the woodsy theme I was looking for. The frame is a burlap memo board and I added a ginko leaf wreath that I've had for a few years. I painted the clay pots green and added some burlap and tied it with jute. I didn't know what to put in the center and I saw my french looking basket in the living room and wanted to try it because of its earthy brownish green color. 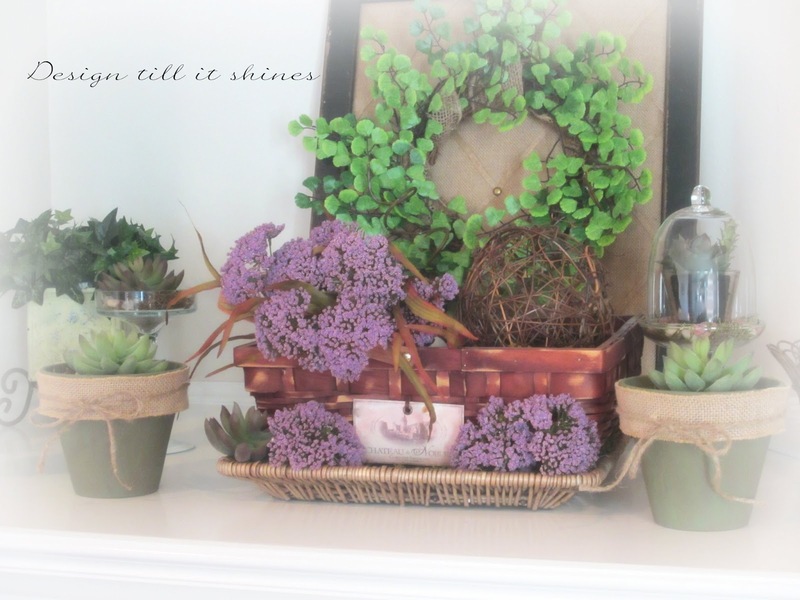 One of the few things I bought were these faux purple flowers and I placed them in the basket and really liked the look. 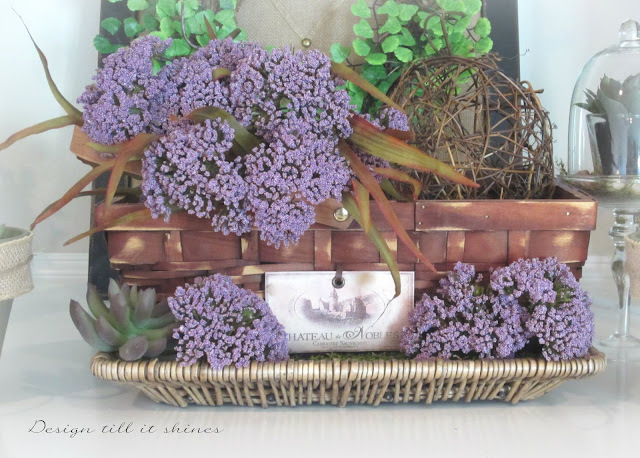 I love how the purple flowers pick up the purple in the tag on the basket. I'm glad I didn't put a plant in the center because I really like the pop of purple and that frenchy look. The mantel is somewhat of an eclectic look but most of my things seem to go in that direction since I like to mix different styles. Just a few simple touches to fill in the space. 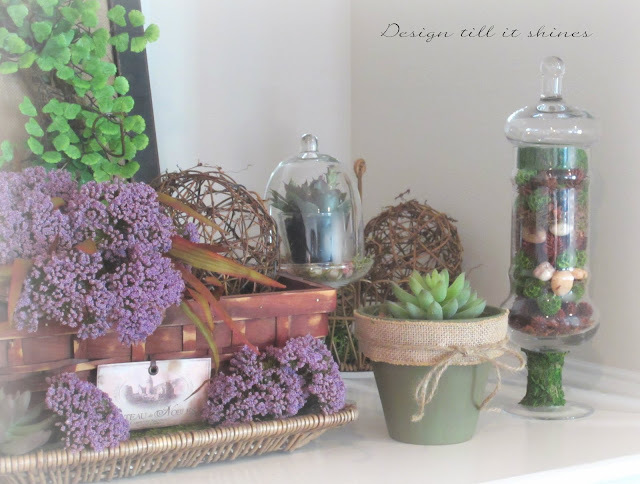 I love grapevine balls and they fill in a space nicely and I added my little cloche as well. We have a builder basic fireplace that isn't really finished off with a mantel. It's on our list of future projects and decorating it with a theme helps define the space a bit better. After I took most of my pics I made a small change to my banner and moved the letters up so more of the mossy banner would show. I like the overall look of this better. Just a bit of softness can add a misty look to your pictures. If you want to see some scenery of the Pacific NW I have added a tab with pictures of a Japanese garden with more pics to come or you can check here. Your mantle looks so beautiful. I love everything about it. The banner is a really cute idea. What a creative idea! It all looks lovely! You have a nice deep mantle! Your summer dressed mantel is soft, dreamy and sweet! You are so lucky that your summers are lush and green and fresh, with forested areas adding such beauty to your surroundings! 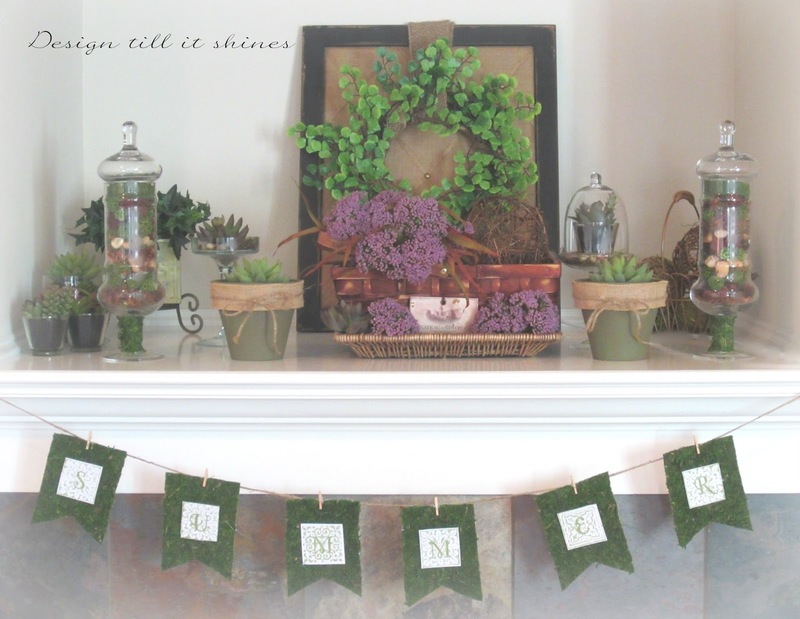 Your mantel is really gorgeous, love how you arranged all the green stuff on it. I like how your mantel is recessed, you can really get some layers going if that was your purpose at any time, gorgeous for Christmas. At least you have a mantel. We have a msfg. single wide 16x80 so no fireplace for us. Hubs made me a great shelf with a shutter, board and some metal brackets I'd been hauling around for years, finally had a great use for them. I have so much fun with my shutter shelf/a.k.a. mantel. I'll style it then I get tired of things and change it about every 2 or 3 weeks. We also have a nook in l/r that hubs put shelves in so I can have fun with those also. As you can tell I have quite a bit of time to piddle like that as we're senior crafters. I've always arranged things then rearrange them. I'll be sitting on couch and all of sudden get urge to change the art on wall around or something on the shutter shelf or nook shelves. I'll go in bathroom and end up priming things differently. I have to stay busy and out of trouble somehow. We are somewhat familiar with your area as hubs was a trucker out of Helena and Missoula, MT. We used to go up to Kalowna, B.C. quite often thru Washington. So pretty. I loved going by the ocean, watch everything as we rode along. We'd go to Troutsdale often also. I miss getting to go but hubs got sick of being on the road so much so he decided to retire from trucking at 62. We lived in KY at that time but later moved here to western CO. Talk about green. We lived out in country north of Bowling Green, farmland, oh so pretty. But I missed mountains. We have mountains all around us where we live out in country again in CO.
We had 20 acres in MT before we moved to KY. The climate there was murder on my arthritis, asthma, and allergies so after 5 yrs. we moved here to be by 2 of our kids. Your mantel is so pretty! Perfect for summer. What a gorgeous banner and mantel...love the touches of moss and the color scheme. Your mantel looks so pretty. I love all the elements you used. The banner is super cute. banner. Never saw the moss done like that before, that is new to me. 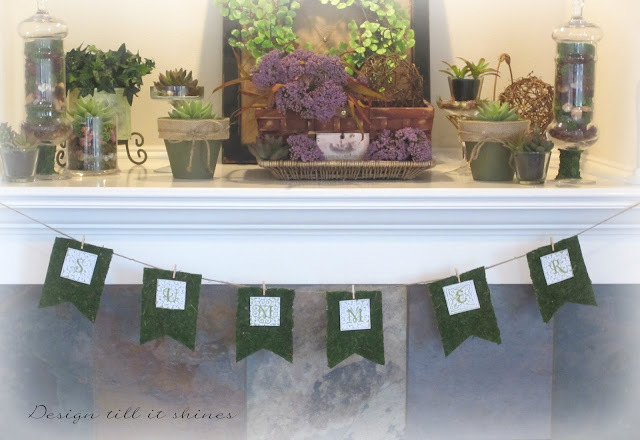 This moss banner is super cute and thanks for sharing it my party this week. I did not know you could buy mossy material like that. Your banner is lovely and I could see it used for many seasons - orange letters for fall or Halloween. Hi, I'm visiting today from your feature at Our Home Away from Home. I love your moss banner and your entire vignette. Gorgeous! How cute it that, I have never seen the moss in sheets like that before. Great craft. 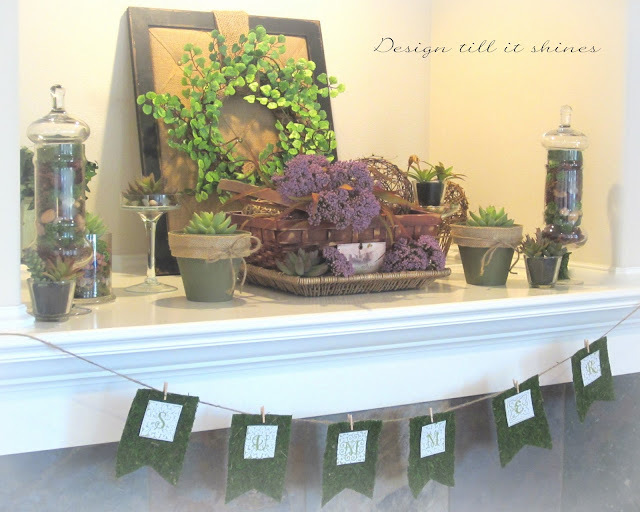 Thanks for sharing at the Cabin's Budget Decorating Party! What a charming banner you created, a great idea! Your entire mantel vignette is so attractive, love all the different textures you used. Love the mossy banner and your nature inspired mantel - so soft and pretty! Your Summer mossy banner is absolutely gorgeous. I love the alphabet font you used and also love the background font. 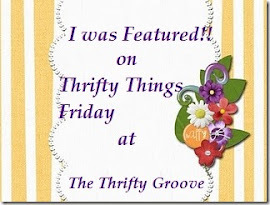 Thanks for stopping by my blog and leaving a lovely comment. 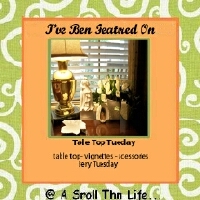 I featured this today on Mod Mix Monday at ModVintageLife! 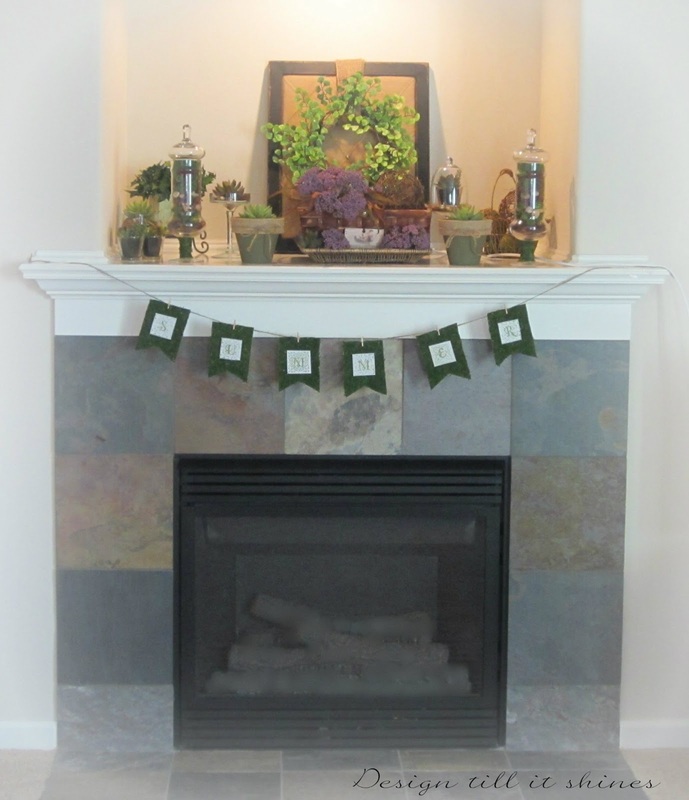 Your mantle looks amazing and the banner just adds so much charm! Thanks so much for sharing at AMAZE ME MONDAY!!! I really like your mantle, Diane. Such a pretty outdoor theme and everything you used goes together so well. 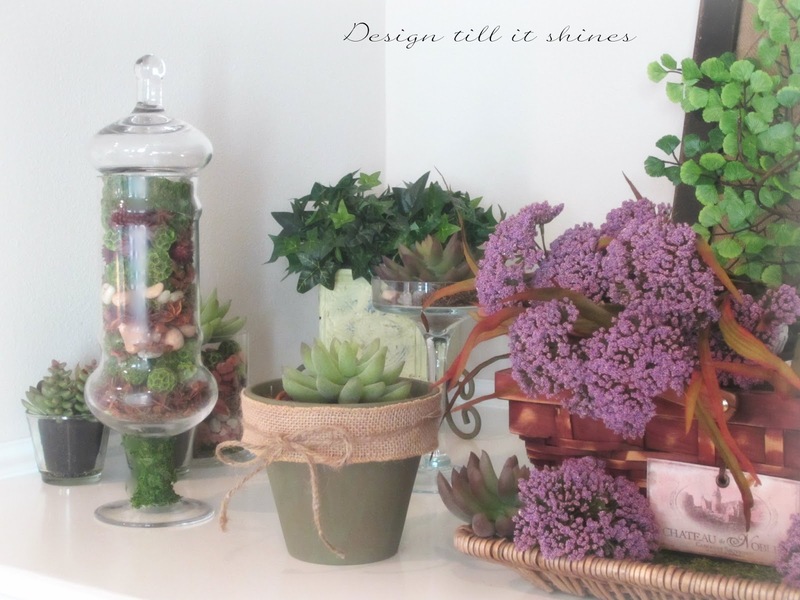 I love using nature in decorating. It shows a lot of interesting facts and admiring content. The topic has the nature of simplicity but the article has a big impact. It is simple but knowledgeable. 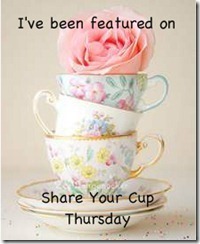 This is a kind of blog that is very rare to hunt online. I appreciate the blogger for the knowledge shared. I love the way moss looks too! 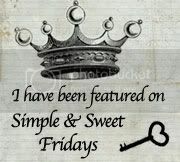 Love the banner you made! That was a great idea to use the sheets. Your mantel looks really pretty!